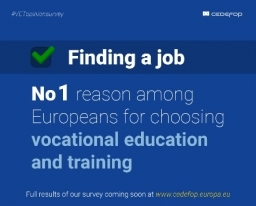 In 2016 Cedefop launched its first ever opinion survey aimed at investigating European citizens’ opinions on Vocational Education and Training (VET). A total of 35,646 interviews were conducted among the citizens of the Member States. 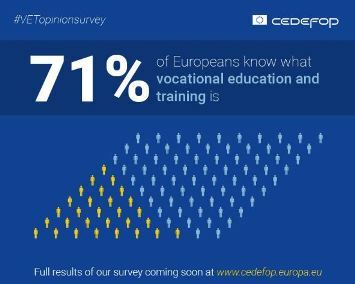 The survey provides unprecedented data on European’s opinions on awareness, attractiveness and effectiveness of vocational education and training in Europe. Improving and maintaining high-level skills and competences of the workforce is essential to ensure that Europe remains competitive and innovative against increasing global competition, fast-changing labour market needs and future demographic challenges. VET has a strategic role in ensuring that Europe has a workforce which is ready for the challenges lying ahead. However participation in both upper secondary and continuous vocational education and training differs greatly among Member States. One of the reasons for this is that in some Member States VET still suffers from a poor image in comparison to general and university education. In 2016 Cedefop launched its first ever opinion survey aimed at investigating citizens’ opinions on VET. Understanding attitudes towards VET will provide important insights for raising VET attractiveness. Between June and July 2016, a total of 35,646 interviews were conducted among the citizens of the Member States to seek their opinions on VET and get key insights on awareness, attractiveness and effectiveness of vocational education and training in Europe. Designed to complement existing European data sources (such as the ELFS, CVTS, AES, Eurobarometer surveys, etc.) this survey provides a unique source of comparative information on how European citizens view vocational education and training. On 23-24 February 2017, Cedefop will organise an expert workshop where the results of the survey will be presented, discussed and analysed.